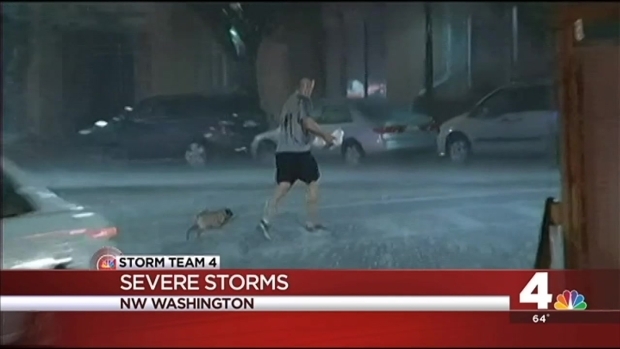 Fast-moving thunderstorms brought lightning, hail and strong wind gusts through the D.C. area Monday evening. Thunderstorms were slow to develop Monday afternoon, but by evening isolated severe storms moved through at 55 mph. Several severe thunderstorm warnings were issued throughout the evening as the storms moved through. A tornado watch for the area expired at 10 p.m. Many parts of the area are already soggy thanks to overnight rain. Storm Team4 meteorologist Amelia Segal said some areas got an inch to 2 inches of rain overnight. The morning rain cleared out at about 7 a.m., making way for sunshine and high temperatures about 80 degrees. Monday evening's storms put on an impressive display or rain, hail, lightning and wind, but no major damage has been reported. A flood warning has been issued for Culpeper and Fauquier counties until late Monday. A flash flood warning for Fredericksburg and Spotsylvania and Stafford counties is in effect until 12:15 a.m.
Cooler temperatures are in store for the rest of the week.